What Should I Know About Lung Cancer? What Are Symptoms and Signs of Lung Cancer? When Should People See a Health Care Professional for Lung Cancer? What Is Lung Cancer Treatment? What Are Lung Cancer Survival Rates by Stage and Type? What Is Lung Cancer Prognosis? What Is the Medical Definition of Lung Cancer? Lung cancer is a group of diseases characterized by abnormal growths (cancers) that started in the lungs. Lung cancer is the leading cause of cancer deaths in women and men both in the United States and throughout the world. Lung cancer has surpassed breast cancer as the leading cause of cancer deaths in women for the past 25 years. In the United States, there are more deaths due to lung cancer than the number of deaths from colon and rectal, breast, and prostate cancer combined. What Are Primary Symptoms of Lung Cancer? If lung cancer is found at an early stage, at least half of such patients will be alive and free of recurrent cancer five years later. Once lung cancer has metastasized, that is, spread to other distant organs, the five-year overall survival is less than 5%. Cancer occurs when normal cells undergo a transformation that causes them to grow abnormally and multiply without control and potentially spread to other parts of the body. The cells form a mass or tumor that differs from the surrounding tissues from which it arises. Cancers are also called malignant tumors. Such tumors are dangerous because they take oxygen, nutrients, and space from healthy cells and because they invade and destroy or reduce the ability of normal tissues to function. How Can Lung Cancer Spread? Most lung tumors are malignant. This means that they invade and destroy the healthy tissues around them and can spread throughout the body. The lung is a bad place for a cancer to arise because it contains a very rich network of both blood vessels and lymphatic channels through which cancer cells can spread. The tumors can spread to nearby lymph nodes or through the bloodstream to other organs. This process of spread is called metastasis. When lung cancer metastasizes, the tumor in the lung is called the primary tumor, and the tumors in other parts of the body are called secondary or metastatic tumors. Some tumors in the lung are metastatic from cancers elsewhere in the body. The lungs are a common site for metastasis. If this is the case, the cancer is not considered to be lung cancer. For example, if prostate cancer spreads via the bloodstream to the lungs, it is metastatic prostate cancer (a secondary cancer) in the lung and is not called lung cancer. What Are Lung Cancer Types? Lung cancer comprises a group of different types of tumors. Lung cancers usually are divided into two main groups that account for about 95% of all cases. The division into groups is based on the type of cells that make up the cancer. The two main types of lung cancer are characterized by the cell size and cell type of the tumor when viewed under the microscope. They are called small cell lung cancer (SCLC) and non-small cell lung cancer (NSCLC). NSCLC includes several subtypes of tumors. SCLCs are less common, but they grow more quickly and are more likely to metastasize than NSCLCs. Often, SCLCs have already spread to other parts of the body when the cancer is diagnosed. About 5% of lung cancers are of rare cell types, including carcinoid tumor, lymphoma, and others. Adenocarcinoma (an NSCLC) is the most common type of lung cancer, making up 30% to 40% of all cases. A subtype of adenocarcinoma is called bronchoalveolar cell carcinoma, which creates a pneumonia-like appearance on chest X-rays. Large cell cancer (another NSCLC) makes up 10% of all cases. Carcinoid tumors account for 1% of all cases. 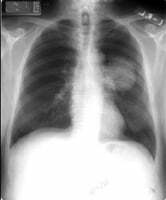 Media file 1: The chest X-ray shows a shadow in the left lung, which was later diagnosed as lung cancer. Media file 2: A CT scan of the lung shows a mass lesion in the right lung. The mass turned out to be lung cancer on examination of the needle biopsy sample. Up to one-fourth of all people with lung cancer may have no symptoms when the cancer is diagnosed. These cancers usually are identified incidentally when a chest X-ray is performed for another reason. The majority of people, however, develop symptoms. The symptoms are due to direct effects of the primary tumor, to effects of metastatic tumors in other parts of the body, or to disturbances of hormones, blood, or other systems caused by the cancer. A cough that does not go away or gets worse over time should be evaluated by a health care professional. Coughing up blood (hemoptysis) occurs in a significant number of people who have lung cancer. Any amount of coughed-up blood is cause for concern. Chest pain is a symptom in about one-fourth of people with lung cancer. The pain is dull, aching, and persistent. Shortness of breath usually results from a blockage to the flow of air in part of the lung, collection of fluid around the lung (pleural effusion), or the spread of tumor throughout the lungs. 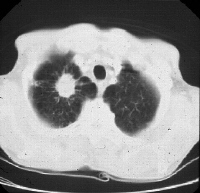 Symptoms of metastatic lung tumors depend on the location and size. About 30% to 40% of people with lung cancer have some symptoms or signs of metastatic disease. Metastatic lung cancer in the liver may cause a loss of appetite, feeling full early on while eating, and otherwise unexplained weight loss. Metastatic lung cancer in the adrenal glands also typically causes no symptoms. Metastasis to the bones is most common with small cell cancers but also occurs with other lung cancer types. Lung cancer that has metastasized to the bone causes bone pain, usually in the backbone (vertebrae), the large bones of the thigh (the femurs), the pelvic bones, and the ribs. Degenerative conditions of the nervous system otherwise unexplained. Cigarette smoking is the most important cause of lung cancer. Research as far back as the 1950s clearly established this relationship. Cigarette smoke contains more than 4,000 chemicals, many of which have been identified as causing cancer. A person who smokes more than one pack of cigarettes per day has a 20-25 times greater risk of developing lung cancer than someone who has never smoked. Once a person quits smoking, his or her risk for lung cancer gradually decreases. About 15 years after quitting, the risk for lung cancer decreases to the level of someone who never smoked. Cigar and pipe smoking increases the risk of lung cancer but not as much as smoking cigarettes. Passive smoking, or secondhand smoke, presents another risk for lung cancer. An estimated 3,000 lung cancer deaths occur each year in the U.S. that are attributable to passive smoking. Air pollution from motor vehicles, factories, and other sources probably increase the risk for lung cancer, and many experts believe that prolonged exposure to polluted air is similar to prolonged exposure to passive smoking in terms of risk for developing lung cancer. 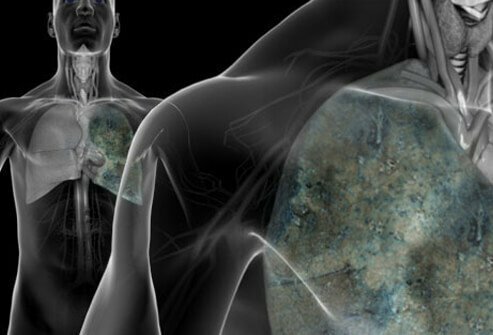 Asbestos exposure increases the risk of lung cancer nine times. A combination of asbestos exposure and cigarette smoking raises the risk to as much as 50 times. Another cancer known as mesothelioma (a type of cancer of the inner lining of the chest cavity and the outer lining of the lung called the pleura, or of the lining of the abdominal cavity called the peritoneum) is also strongly associated with exposure to asbestos. Lung diseases, such as tuberculosis (TB) and chronic obstructive pulmonary disease (COPD), also create a risk for lung cancer. A person with COPD has a four to six times greater risk of lung cancer even when the effect of cigarette smoking is excluded. Radon exposure poses another risk. Radon is a byproduct of naturally occurring radium, which is a product of uranium. Radon is present in indoor and outdoor air. The risk for lung cancer increases with significant long-term exposure to radon, although no one knows the exact risk. An estimated 12% of lung cancer deaths are attributable to radon gas, or about 21,000 lung cancer-related deaths annually in the U.S. Radon gas is the second leading cause of lung cancer in the United States after cigarette smoking. As with asbestos exposure, smoking greatly increases the risk of lung cancer with radon exposure. Certain occupations where exposure to arsenic, chromium, nickel, aromatic hydrocarbons, and ethers occurs may increase the risk of lung cancer. Upon hearing about the symptoms, a health care provider will formulate a list of possible diagnoses. The doctor will ask questions about the symptoms, medical and surgical history, smoking and work history, and other questions about lifestyle, overall health, and medications. Unless severe hemoptysis is occurring, a chest X-ray will most likely be performed first to look for a cause of the respiratory symptoms. The X-ray may or may not show an abnormality. Types of abnormalities seen in lung cancer include a small nodule or nodules or a large mass. Not all abnormalities observed on a chest X-ray are cancers. For example, some people develop scarring and calcium deposits in their lungs that may look like tumors on a chest X-ray. In most cases, a CT scan or MRI of the chest will further define the problem. If symptoms are severe, the X-ray may be skipped and a CT scan or MRI may be performed right away. The advantages of CT scan and MRI are that they show much greater detail than X-rays and are able to show the lungs in three dimensions. These tests help determine the stage of the cancer by showing the size of the tumor or tumors. They can also help identify spread of the cancer into nearby lymph nodes or certain other organs. If a person's chest X-ray or scan suggests that a tumor is present, he or she will undergo a procedure for diagnosis. Diagnosis requires analysis of cells or tissue sufficient to make the cancer diagnosis with certainty. This procedure involves collection of sputum, removal of a small piece of the tumor tissue (biopsy) or a small volume of fluid from the sac around the lung. The retrieved cells are reviewed under a microscope by a doctor who specializes in diagnosing diseases by looking at cell and tissue types (a pathologist). Several different ways exist to obtain these cells. Sputum testing: This is a simple test that is sometimes performed to detect cancer in the lungs. Sputum is thick mucus that may be produced during a cough. Cells in the sputum can be examined to see if they are cancerous. This is called cytology testing. This is not a completely reliable test. If negative, the findings usually need to be confirmed by further testing. Bronchoscopy: This is an endoscopic test, meaning that a thin, flexible, lighted tube with a tiny camera on the end is used to view organs inside the body. Bronchoscopy is endoscopy of the lungs. The bronchoscope is inserted through the mouth or nose and down the windpipe. From there, the tube can be inserted into the airways (bronchi) of the lungs. A tiny camera transmits images back to a video monitor. The physician operating the bronchoscope can look for tumors and collect samples of any suspected tumors. Bronchoscopy can usually be used to determine the extent of the tumor. The procedure is uncomfortable. A local anesthetic is administered to the mouth and throat as well as sedation to make bronchoscopy tolerable. Bronchoscopy has some risks and requires a specialist proficient in performing the procedure. Needle biopsy: If a tumor is on the periphery of the lung, it usually cannot be seen with bronchoscopy. Instead, a biopsy is taken through a needle inserted through the chest wall and into the tumor. Typically, a chest X-ray or CT scanning is used to guide the needle. This procedure is safe and effective in obtaining sufficient tissue for diagnosis. After the chest surface is cleaned and prepared, the skin and the chest wall are numbed. The most serious risk with this procedure is that the needle puncture may cause an air leak from the lung (pneumothorax). This air leak occurs in as many as 3%-5% of cases. Although this condition can be dangerous, it is almost always recognized quickly and treated without serious consequences. Endoscopic ultrasound with fine-needle aspiration of an abnormal mass or lymph node may also be performed at the time of bronchoscopy. Thoracentesis: This a procedure that removes a sample of fluid from the pleural cavity surrounding the lungs. Lung cancers, both primary and metastatic, can cause fluid to collect in the sac surrounding the lung. This fluid is called a pleural effusion. The fluid usually contains cells from the cancer. Sampling this fluid can confirm the presence of cancer in the lungs. The fluid sample is removed by a needle in a procedure similar to needle biopsy. Thoracentesis can be important for both staging and diagnosis of the condition. Thoracotomy: Sometimes a lung cancer tumor cannot be reached by bronchoscopy or needle procedures. In these cases, the only way to obtain a biopsy is by performing an operation. The chest is opened (thoracotomy), and as much of the tumor as possible is removed surgically. The removed tumor is then examined microscopically. Unfortunately, this operation may not be successful in removing all tumor cells if the tumor is large or has spread to the lymph nodes outside of the lungs. Thoracotomy is a major operation that is performed in a hospital. Mediastinoscopy: This is another endoscopic procedure. It is performed to determine the extent that the cancer has spread into the area of the chest between the lungs (the mediastinum). A small incision is made into the lower part of the neck above the breastbone (sternum). A variation is to make the incision in the chest. A mediastinoscope that is similar to a bronchoscope is inserted behind the breastbone. Samples of the lymph nodes are taken to evaluate for cancer cells. Mediastinoscopy is a very important step to determine whether the tumor can be surgically removed or not. Staging is the process of establishing the extent of the cancer once the diagnosis is made, so that an appropriate course of treatment can be planned. The results of all of the diagnostic testing and procedures are reviewed to determine what information might be needed to accurately stage the patient. A bone scan can determine whether the cancer has spread to the bones. A bone scan and bone X-rays, particularly in the absence of PET scan availability, can determine whether the cancer has spread to the bones. Molecular testing on the cancerous tissue may help to determine eligibility for specific options for treatment. Staging systems classify the patient's disease based upon the results of the evaluation completed. Staging: Staging is a method of classifying the tumor for purposes of treatment planning. Staging is based on size of the tumor, location of the tumor, and degree of metastasis of the tumor (if any). The treatment will be individually tailored to the tumor stage. Tumor stage is related to the outlook for cure and survival (prognosis). The higher the tumor stage, the less likely the disease will be cured. In contrast to staging, "grading" of lung cancer involves classification of the tumor cells under a microscope. The grade of a cancer is a measure of the abnormality of the cancer cells when compared to normal cells. High-grade tumors have a very abnormal appearance and tend to grow rapidly. Treatment decisions in lung cancer depend first on whether SCLC or NSCLC is present. Treatment also depends on tumor stage. In NSCLC, the performance status of the patient is a key determinant of the likelihood of benefit from treatment. Performance status compares the patient's functional status -- how well they are doing as compared to their pre-illness levels of day to day activity. Risk of side effects and complications increase and chance of benefit decreases with declining performance status. In SCLC, a rapid response to treatment occurs often enough to overcome this issue. The most commonly used treatments today for lung cancer involve surgery, radiation therapy, chemotherapy, and targeted therapies. In SCLC (small cell lung cancer), patients with limited disease at presentation (disease confined to one lung and its regional lymph nodes) are distinguished from those with extensive stage disease, which includes all cases not classified as limited. Limited stage disease, treated with radiation and chemotherapy (including prophylactic, or preventative, brain radiation therapy), will frequently have all evidence of disease disappear for a time and are said to enter remission. About 80% will relapse within 2 years, but as many as 10% to 15% may survive 5 or more years. In extensive stage SCLC, response to chemotherapy and palliative radiation occurs less frequently, and survival beyond 2 years is rare. Median survival is about 13 months. In NSCLC, non-small cell lung cancer, those patients deemed medically inoperable may be treated with curative intent with radiation therapy with 5-year survival in early stage disease from 10% to 25%. In advanced stage, inoperable stages IIIB and IV NSCLC, treatment remains non-curative, but palliative radiation therapy and chemotherapy can provide meaningful symptom improvement and prolongation of life as compared to only supportive care. The use of targeted therapies in NSCLC has been of increasing importance especially in adenocarcinoma of the lung. Agents with lower levels of toxicity and efficacy at least as good as chemotherapy have been identified which can be utilized in patients whose cancer cells show mutations in specific genes. In addition, the use of agents targeted to other features of lung cancer, such as tumor factors to recruit blood vessels to support their growth, have been developed and have proven advantageous in the palliative treatment of NSCLC. Side effects of radiation therapy vary with the area being treated, the dose being given, and the type of radiation technique and equipment being used. Side effects of chemotherapy again vary with the drug being given, the dose being used, and the patient's unique sensitivity to the type of chemotherapy selected. There are a wide variety of both chemotherapies and targeted agents that may be tried in these cases. Finally, preventive or adjuvant chemotherapy, has been utilized in operable stages of NSCLC in an attempt to eradicate microscopic, hidden deposits of lung cancer that may have escaped prior to surgery, and remain undetectable for now but will cause relapse later if not killed. While not of proven use in stage I NSCLC, it does appear to be of potential benefit in stages II and IIIA disease. Surgery is the preferred treatment for patients with early stage NSCLC. Unfortunately, a majority of patients have advanced or metastatic disease and are not suitable candidates for surgery after completing their staging evaluation. People who have NSCLC that has not spread can tolerate surgery provided they have adequate lung function. A portion of a lobe, a full lobe, or an entire lung may be removed. The extent of removal depends on the size of the tumor, its location, and how far it has spread. Cure rates for small cancers at the edges of the lung are around 80%. Despite complete surgical removal, many patients with early stage cancer have a recurrence of the cancer and die from it either due to local recurrence, distant metastases, or both. Surgery is not widely used in SCLC. Because SCLC spreads widely and rapidly through the body, removing it all by surgery usually is impossible. An operation for lung cancer is major surgery. Many people experience pain, weakness, fatigue, and shortness of breath after surgery. Most have problems moving around, coughing, and breathing deeply. The recovery period can be several weeks or even months. Following surgery for operable lung cancer cases, there is an increased risk of developing a second primary lung cancer as well as risk that the original tumor will come back. Many lung cancers come back within the first 2 years after treatment. Regular testing should be performed so that any recurrence can be identified as early as possible. A person who has undergone surgery should receive follow-up care and examinations according to recommendations from the treatment team. Palliative care refers to a specialty of patient care focused on helping the patient to understand their options for treatment, to be certain that both physical, psychological, social, financial, and other potential stressors and symptoms are being addressed, and that advance directive issues are being addressed. It is not the same as hospice care. It is appropriate during both curative treatment and during times when treatment is not expected to be curative. Palliative care consultation in combination with usual non-curative chemotherapy and radiation for advanced lung cancer has been shown to be associated with a prolonged median survival as compared to chemotherapy and radiation alone. Hospice care refers to care provided to optimize symptom control when all other treatment options have been unsuccessful or are declined. It focuses on supporting the patient and their family with home visits, equipment, counseling, and medication and coordination of care to maintain what quality of life can be provided at that point in the illness. This may mean, for example, keeping the patient at home rather than readmitting the patient for terminal symptom management, which can be provided at home with specialized support. The patient, his or her family, and the doctor will probably recognize when the patient has reached the point that hospice care is necessary. Whenever possible, the transition to hospice care should be planned in advance. Planning should begin with a three-way conversation between the patient, someone representing the patient (if he or she is too ill to participate), and the health care professional. During these meetings, likely outcomes, medical issues, and any fears or uncertainties can be discussed. Hospice care may be given at home, in a hospital if home care is not possible, or in a hospice facility. Breathlessness will be treated with oxygen and medications such as opioids, which are narcotic drugs such as fentanyl, morphine, codeine, methadone, oxycodone, and dilaudid. Pain management includes anti-inflammatory medications and opioids. The patient is encouraged to participate in determining doses of the pain medication, because the amount needed to block pain will vary from day to day. Other symptoms, such as anxiety, lack of sleep, and depression, are treated with appropriate medications and, in some cases, complementary therapies. Prevention is primarily focused on smoking cessation. Smokers who wish to quit obtain benefit from many different strategies, including nicotine replacement therapy with patch or gum, varenicline (Chantix), counseling, and support groups. Smokers who do not wish to quit, but are told that they must, often will relapse if they can ever quit at all. Passive tobacco smoke exposure as secondhand smoke is a contributor to lung cancer incidence and should be discouraged. Radon detection kits for testing the home and workplace can be recommended. Radon exposure is a cause of more than 10,000 lung cancer deaths per year worldwide, and is a leading cause of lung cancer in nonsmokers. Adults between 55 and 77 years of age with a history of at least 30 pack years of cigarette smoking, either currently smoking, or who have quit in the past 15 years, and who have discussed the risks and benefits of CT screening with the ordering physician and have undergone documented smoking cessation counseling should undergo annual low-dose CT scan screening. Such testing has been demonstrated to reduce the risk of dying from lung cancer by 15% to 20% as compared to those receiving only an annual chest X-ray. Overall (considering all types and stages of lung cancer), 18% of people with lung cancer survive for at least 5 years. Survival rates tend to be low when compared to the 65% 5-year survival rate for colon cancer, 91% for breast cancer, and over 99% for prostate cancer. People who have early stage (stage I) NSCLC and undergo lung surgery have a 60% to 70% chance of surviving 5 years. People with extensive nonoperable lung cancer have an average survival duration of 9 months or less. Those with limited SCLC who receive chemotherapy have a 2-year survival rate of 20% to 30% and a 5-year survival rate of 10% to 15%. Less than 5% of people with extensive-stage SCLC (small cell cancers) are alive after 2 years, with a median survival range of eight to 13 months. Living with cancer presents many new challenges for people with cancer and for their family and friends. People with cancer will probably have many worries about how the cancer will affect them and their ability to live a normal life, that is, to care for their family and home, to hold a job, and to continue the friendships and activities they enjoy. Friends and family members can be very supportive. They may be hesitant to offer support until they see how the person with cancer is coping. People with cancer should not wait for friends or family to bring it up; if they want to talk about their concerns, they should let friends and family know. Some people do not want to burden their loved ones or just prefer talking about their concerns with a more neutral professional. Discussing feelings and concerns about having cancer with a social worker, counselor, or member of the clergy can be helpful. A surgeon or oncologist should be able to recommend someone. Many people with cancer are profoundly helped by talking to other people who have cancer. Sharing concerns with others who have been through the same thing can be remarkably reassuring. Support groups of people with cancer may be available through the medical center where treatment is being received. The American Cancer Society also has information about support groups all over the United States. Symptoms and signs of widespread (metastatic) disease can include headaches or seizures, bone pain, and weight loss. American Joint Committee on Cancer. "Lung Cancer Staging." <http://cancerstaging.org/references-tools/quickreferences/documents/lungmedium.pdf>. Santacroce, Luigi. "Paraneoplastic Syndromes." Medscape.com. Aug. 13, 2014. <http://emedicine.medscape.com/article/280744-overview>. United States. National Cancer Institute, U.S. National Institutes of Health. "What You Need to Know About Lung Cancer." July 2012. <http://www.cancer.gov/cancertopics/types/lung>. Please describe your experience with lung cancer. What symptoms and signs did you experience with your lung cancer? What treatment(s) have you received for lung cancer? What caused your lung cancer?